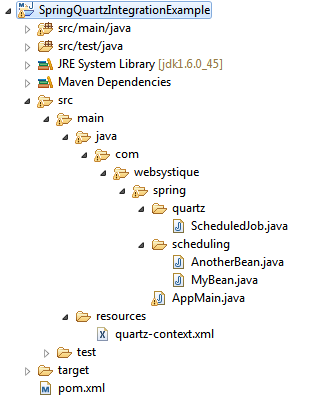 In this post we will see how to schedule Jobs using Quartz Scheduler with Spring. Spring provides couple of classes that simplify the usage of Quartz within Spring-based applications. Let’s get going. Really handy when you just need to invoke a method on a specific bean. This is the simplest among two. When you need more advanced setup, need to pass data to job, being more flexible. jobClass refers to a class which extends QuartzJobBean, an implementation of Quartz job interface. On invocation of this job, it’s executeInternal method gets called. jobDataMap provides opportunity to pass some data to underlying job bean. In this case, we are passing a bean ‘anotherBean’ which will be used by ScheduledJob. Below is the referred jobclass (ScheduledJob) implementation. You can specify start time, delay between triggers and repeatInterval(frequency) to run the job. It’s more flexible and allows you to choose scheduled job at specific instance (time, day, date,..) and frequency in future. Run it as Java application, you will see following output. You can see that SimpleTrigger invoked job is called every two seconds while the one from CronTrigger is called every five seconds.